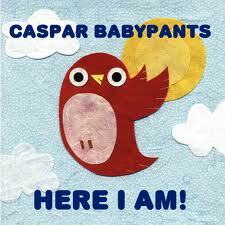 Check It Out: Caspar Babypants – Here I Am! Here I Am! Not me, but the name of the debut album of this awesome band. Please note that since it’s release in 2009 there have been 3 more releases in less than 4 years. Two of them released in the same year. I would say that is pretty awesome but what is even more awesome is that Chris Ballew, the man behind the music, is the former lead singer of “Presidents of the United States of America.” Yes, those people. Yes, that song “Lump.” Regardless of how you felt about Presidents (I was a fan!) you can’t deny their propensity to produce a catchy tune or two. Well, Ballew has moved into the Kindie arena and it seems to be a beautiful fit. So, get on over to their site and check out their sound. You can listen to samples from each album as well as buy the CD or individual tracks directly from their site. Here are some videos from this release, just to whet your appetite (these can also be found on the site as well).